Resilience is the capacity to bounce back in the face of adversity. Being resilient does not mean that an individual can go through life stress-free. Resilient individuals work through their emotions and know how to self-manage situations. 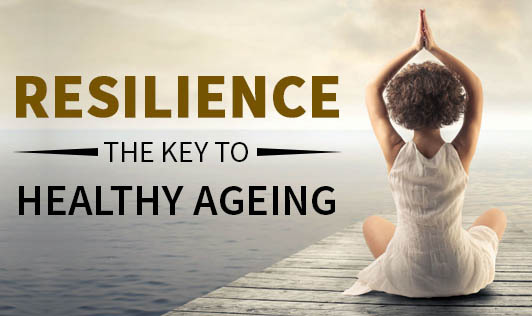 It is a skill of a lifetime and a very crucial mechanism for productive aging. At a later age, it defines how individuals cope with critical events in life, example- the loss of a partner or unemployment. Don’t see crises as undefeatable problems. You can’t change the reality that highly stressful events occur, but you can change how you interpret, react, and accept them. Look beyond the present knowing that nothing ever stays the same. Accept change as part of life. Accepting things you cannot change can help you focus on those you can. Develop some realistic goals. Take actions regularly- small steps that enable you to move toward your goals. Shift your focus to those tasks that you can accomplish rather than the tasks that are daunting and seem unachievable. Find opportunities for self-discovery. We often find ourselves learning something about ourselves and growing as individuals, even as we struggle to cope with a loss that we have faced. Take decisive actions. Learn to face adverse situations, rather than avoiding the problems and stresses completely and wishing them away. Keep things in perspective. Even when facing difficult situations, try and remind yourself to look at the bigger picture, keeping in mind a long term perspective. Try not to blow the event out of proportion. Maintain a hopeful outlook. An optimistic attitude enables you to expect that good things will happen in your life. Make an effort to visualise the positives, rather than worrying about what you fear. There is always hope. Take care of yourself. Pay heed to your own needs and feelings. Start doing those activities that you enjoy and find relaxing. Exercise regularly. Taking care of yourself helps to keep your mind and body prepared to deal with situations that require resilience. Make connections. Good relationships with family members, friends, and colleagues are important. Learn that accepting help and support from those who care about you and will listen to you, builds resilience. Start taking action, no matter how small it may seem, to better your life every day. Resilience has to be developed and perfected over time with practice. Remember “being resilient” doesn’t mean nothing bad ever happens to you, it means when something bad does happen, you bounce back.